This year, the Association for Persons with Special Needs (APSN) organized a walkathon fundraiser during the Chinese Lantern Festival. Each walker was given a goodie-bag that included a paper lantern on a stick that people could carry during the walk (they wanted to set a world record for the largest-ever lantern walk...) Due to haze, a lot of people didn't show up, so they were left with nearly a thousand goodie bags. 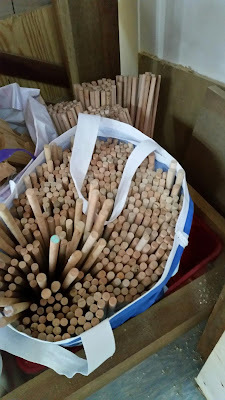 Since our school played a big part in helping organize the event, we were left with the remaining goodie bags and I was lucky enough to inherit a ton of wooden dowels. 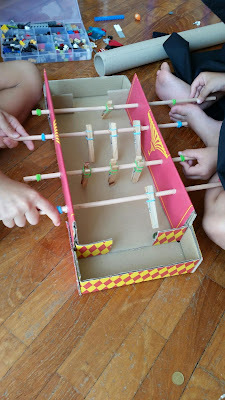 My own kids are into foosball these days, after playing on one at a pizza place we ate at. 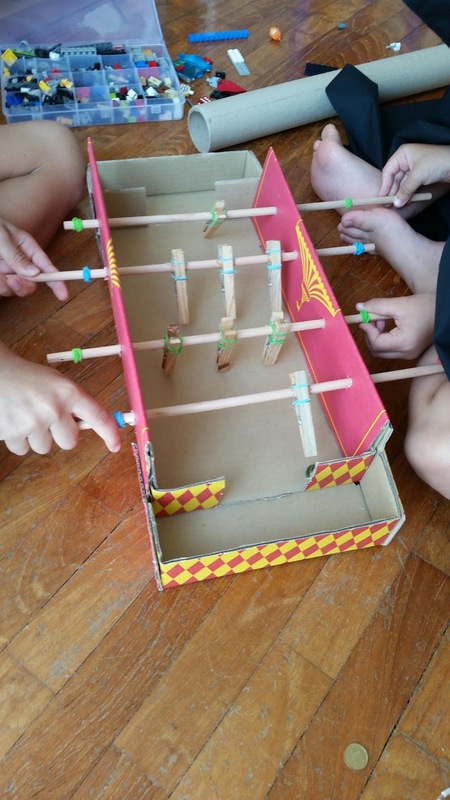 It wasn't much of a leap to put these things together and make a pizza box foosball game with the addition a few clothes-pegs and some rubber bands. Once they are finished with it, this will serve as a nice prototype for my students. It works OK, but there are definitely some things that could be improved. It will be interesting to see what they come up with to make it better. Once you start collecting stuff, and people know you collecting stuff, things start to come to you. I was at the walkathon and started pulling discarded dowels out of the trash at the end of the evening. I managed to scoop a dozen or so. But the next day, I found that huge bag waiting outside of my classroom with a lovely note saying, "Hi Ben. When we ended up with these, of course I thought of you!"